Already, Thompson Alchemists is hosting its’ newest event! 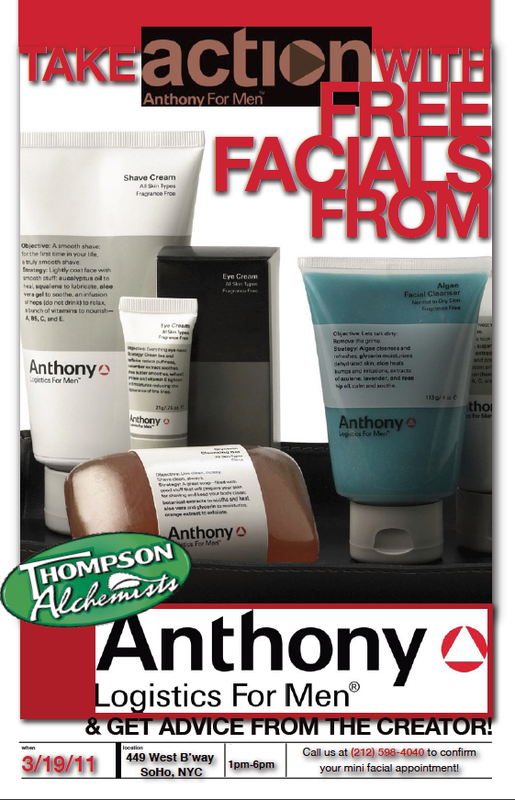 A team of experts from Anthony Logistics alongside with the creator himself , Anthony, will be conducting free facials at Thompson Alchemists Saturday 19th, 2011 from 1pm – 6pm. Appointments are greatly recommended and each facial will last approximately 20 minutes. Additionally , the experienced Anthony staffers will gladly answer any questions you may have and provide you with one-on-one skin consultations. It is a huge honor for us to be hosting this event and we are so excited for it! We hope you can make it — call today to reserve a time slot that best conveniences you!